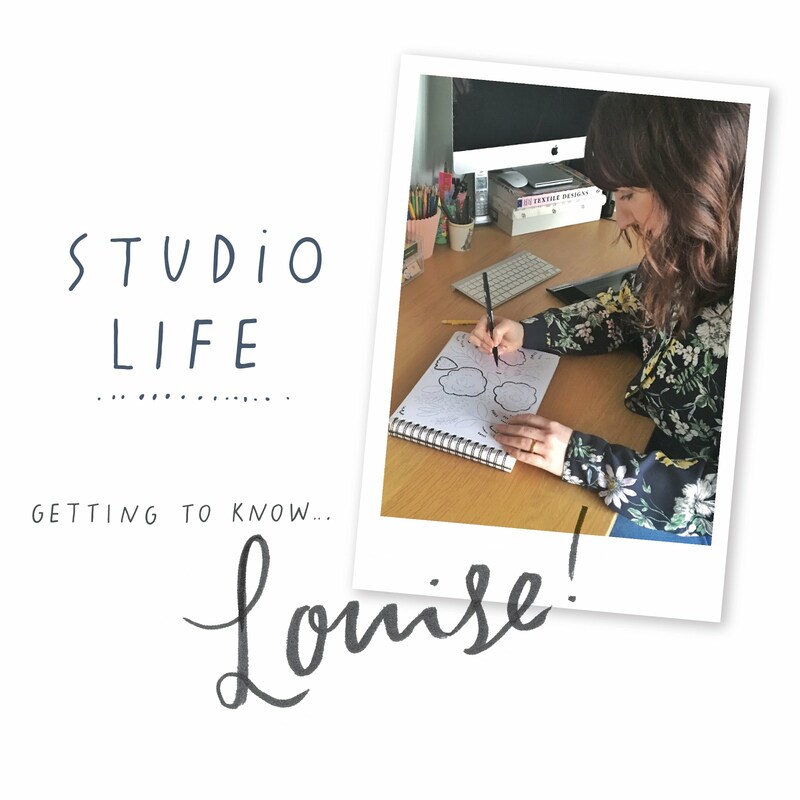 Today's Q&A is with our lovely studio manager Louise. Lou juggles the day to day running of the studio whilst also being a tip top illustrator - we don't know how she does it! Hi Lou! Can you start off by telling us a little bit about where you gather your inspiration from? I'm a huge Pinterest, Instagram and general blog addict, and I love a daily scroll through for inspiration, whether it be a new colour palette idea, an emerging trend, or seeing something new from a favourite brand or designer. Some of my current blog loves are Little Gatherer, Petit & Small, Artistic Moods and Paper Crave. 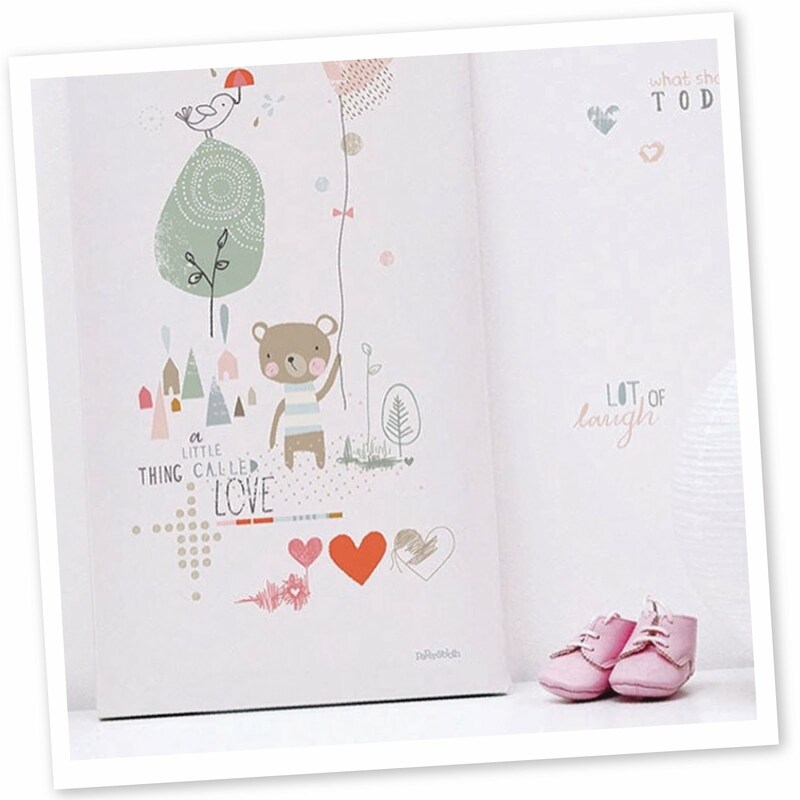 I also find children's picture books hugely inspirational, and I like to keep up to date with favourite kidswear, homeware and stationery brands. Plenty to help stay inspired! Every design I create starts with a rough sketch. Depending what look I want to achieve sometimes I'll refine them, so the paints, brush pens and fine liners come out. Other times I'll simply scan them and take them in to Illustrator and/or Photoshop to develop. I usually have an idea in mind as to what the finished piece will look like, but I also enjoy the experimentation stage that naturally happens when working digitally; playing with composition and layout, colour tweaks, character development etc... It's a process that can change the original plan for the better. 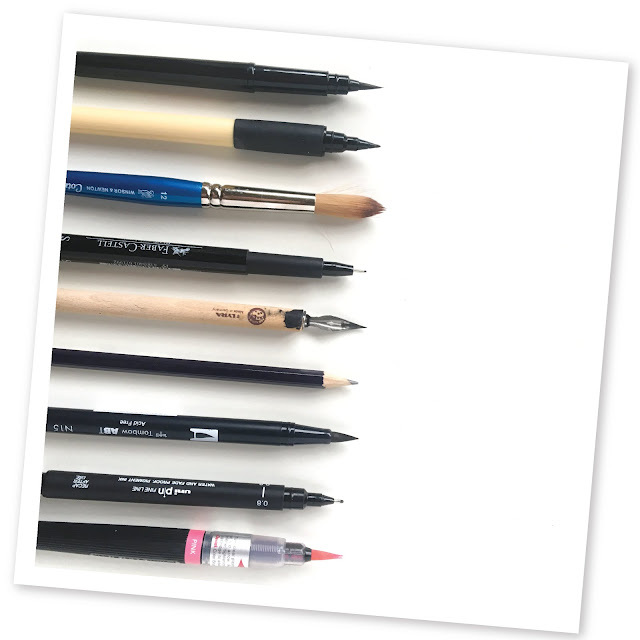 Sketchbook and pencils... everything starts with that! A Wacom obviously goes without saying and I love brush pens. I enjoy playing with texture in my work so I'd include watercolours, inks and paints too. My most recent addition is an iPad Pro and Apple pencil so I'm enjoying learning and experimenting with procreate at the moment! Ooh, that's a difficult one, the list is literally endless! Lara Hawthorne - the delicacy and amount of beautiful detail in her work is just stunning, and I adore her book "The Night Flower"
Emily Rand would have to be another, and how she creates her illustrations using such gorgeous textures and mark making. Hannah Tolson would also have to get a mention too... her wonderful characters, the mixed media quality to her art, all those lovely paint and crayoned textures, and she manages to create scenes that you just want to jump into! Finally Susie Hammer's bold, playful characters always make me smile! There are sooooo many more, but we'd be here all day! I've been extremely fortunate to have clients such as Lilipinso, Land of Nod and Paperchase use my designs on their products, but looking to the future, I have some really exciting projects that I can't share as yet. And it's not a dream client as such, but it'd be great to be involved in illustrating a children's book. My current read is 'The Keeper of Lost Things' by Ruth Hogan and next on the list is 'Eleanor Oliphant is Completely Fine' by Gail Honeyman which I've heard great things about. I'm also partial to a good cookbook! I have a few bits and pieces dotted around by various designers; Clare Owen, Studio Violet, Hannah Cole... but my favourite would have to be my lovely 'Pirum Parum' print by Fine Little Day. 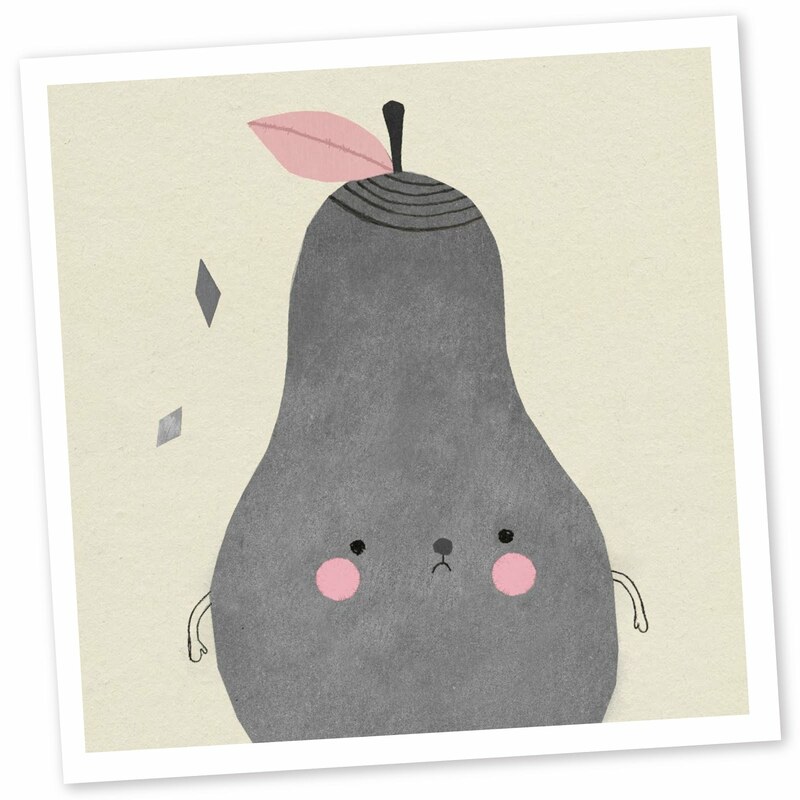 I love it's simplicity and subtle texture, and the little pear is oh so cute, even if a little sad! I'm a huge foodie so I spend a lot of time looking at food blogs and cookbooks for new recipes I want to try, eating out and cooking at home. 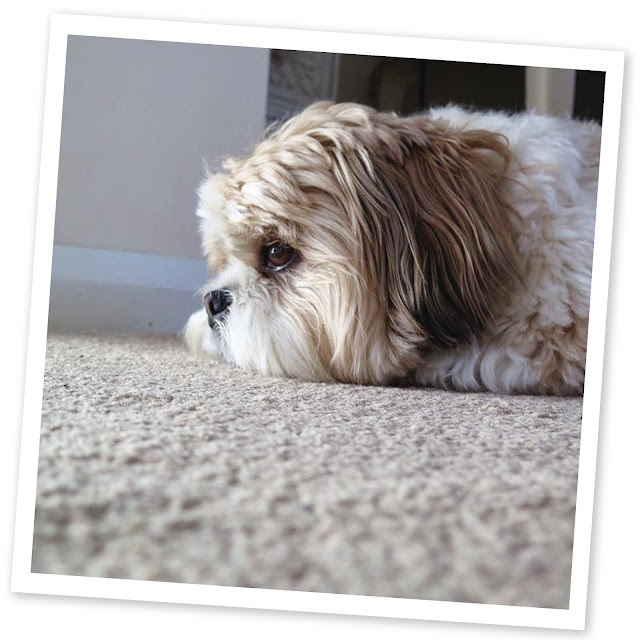 Spending time with my family is pretty high up on the agenda for me, and plenty of long walks with Alfie, our Lhasa Apso, especially holidays in the Lake District... perfect with a four legged friend! 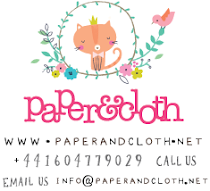 I'm also a keen "photo taker" and enjoy creating content for my blog, Love Print Studio, where I curate and share mood boards, colour inspiration and other design related topics. Oh, Alfie, what a heartbreaker! 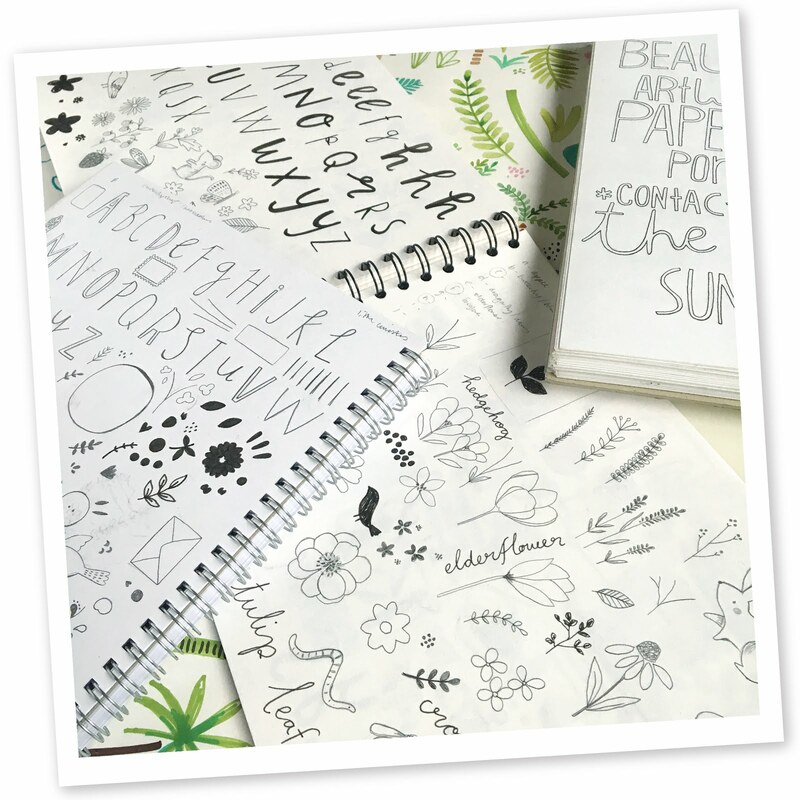 Lou, we love seeing your sketched ideas and are definitely going to be checking out those blogs, thanks! We'll be catching up with another of our Illustrators for some more tea-break reading very soon.